Spent around an hour this evening before wrapping up the day practicing the drawing and getting ready for the work week. Got a large stack of commissions, drawing requests and more waiting for me this week, and no better way to limber up and get some training in then drawing athletic action shots. Most of these were pulled from googling 'athlete action' in google images. Other search terms were 'Olympic athlete action' and so forth. Athletes are good practice/ drilling for super hero stuff and drawing comics where you have to do lots of different poses and angles. Drawn in Inkscape in about an hour. Click the picture to enlarge the view. As of this post all art sent! Thanks so much for all the 150th episode of Drawing Request Show hype! I planned on just doing a normal stream but occassionaly mentioning that it was the 150th stream. Well, it turned into an outcry of support and appreciation from many of the regulars and I was very touched and overwhelmed with the support. In return we spun a lot of gratitude wheels, and did 3 bonus giveaways! I try to get between 6 and 12 drawings done in a stream (depending on what goes on in the stream) and today I only got 5 done haha. 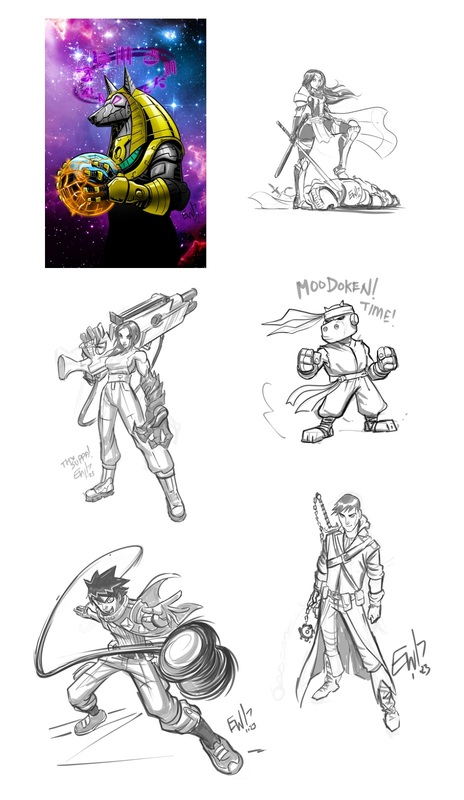 Not includeing the warmup of Moobot mixed with Ryu. Was a blast, really reinforced that I'm doing something people really seem to enjoy watching muchless participating in. One part drawing stream, one part gameshow, one part silly stream. Drawing Request Show now embarks on its next goal of 200 episodes, and I'm excited and have NO IDEA what the next 150 will bring. Always amazing, always something different. See folks tomorrow 2pmET for the Drawing Request Show Upgrades stream which is now every Tues/ Thurs between normal DRS streams. Looking forward to it! Check out the hour long train of 150 hype donation support and the ensuing wheels in this special clip from the stream! Also a shorter clip from when the Gratitude Wheel goes haywire on me LOL. (Or rather winamp). And hilarity ensues. 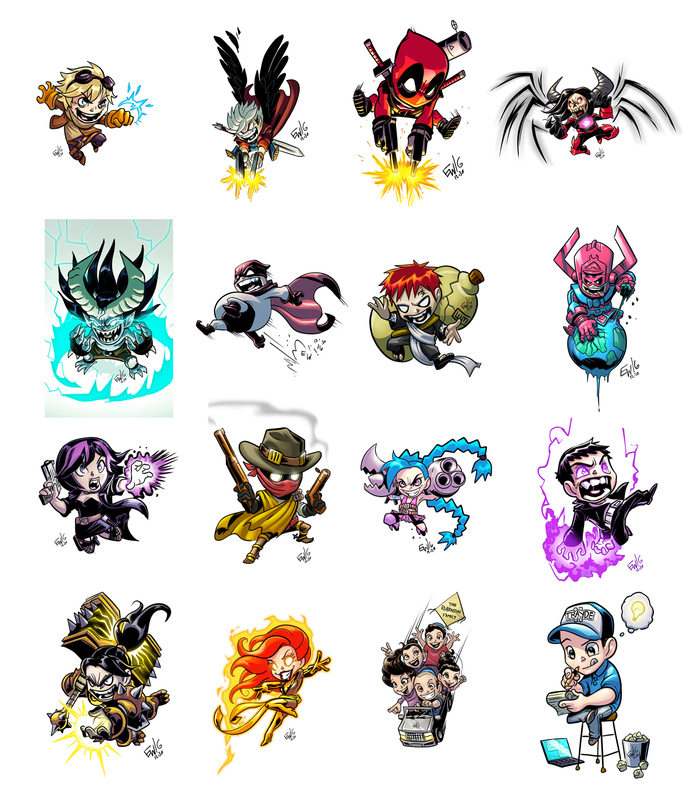 Heres a batch of 16 (20 if you count the 5 in the car one seperately) chibi commissions all wrapped up! Was fun watching these work their way down the assembly line in the ol' mill. Happy to be able to send them out and into the hands of those who bought them! Thanks for those who came out and discovered the 'secret stream' i was doing all afternoon :) I worked on the last half starting from galactus down, which took from when I started around noon till about 330pm. Not too bad! 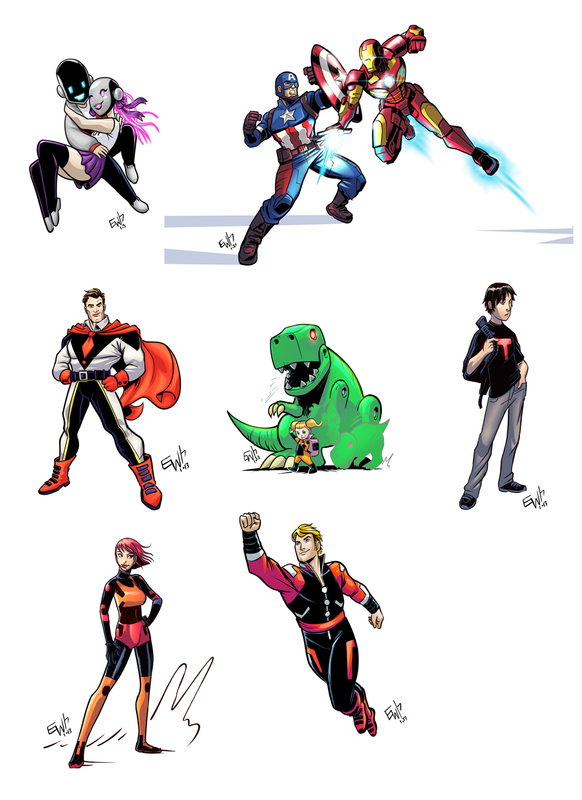 They were all pre flatted by the othe rhalf of my business Kristina and I added the shades/ highlights and effects to them all. Good stuff. Now on to take the dog for a walk and get some buffalo chicken going for the steelers game in a couple of hours! Have a great Sunday and see folks when I get back to it at work this week. for now the mill is winding down. Have a good night! Alright! This Saturday edition of DRS is a wrap! 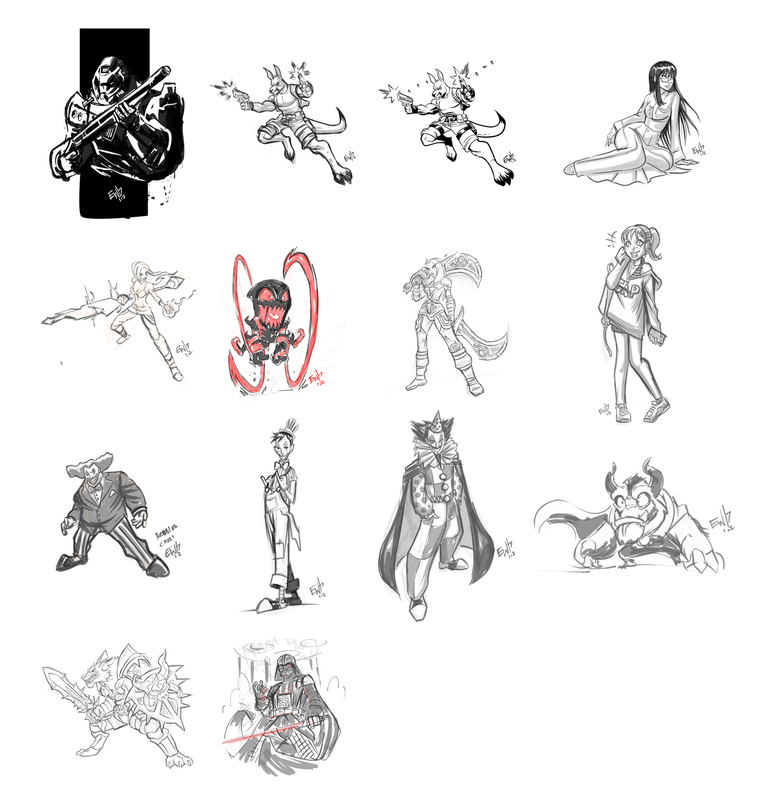 And all these pieces have been sent to their respective requesters! Upgrades are fun :) This officialy kicks off the new schedule! See you Monday for more! For more info on the new schedule please visit http://twitch.tv/eryckwebb for the full listing. Basicly I'm making more of an effort to get Upgrades done. People are awesome for making requests much less upgrading their sketches for the full inks and colors, so they deserve to get them soon as they can! Thanks to everyone who came out made this kickoff of the new schedule a big success! Also in true Drawing Request Show fashion, congrats to the giveaway winners! Have a great rest of your weekend and see you Monday at 2pmET! Finished slot commissions for this week, of Lost Ghost the urban crime fighter and Karen the wicked whip maiden. Fun slot commissions. I occassionaly open up available slots that are guarunteed within one week when a weeks revenue doesnt really hit the ol' goals. Look for future slot openings to appear on fridays and end sunday nights/ monday mornings ( they are for sale over the weekend so I can get started on them the following week! ). The price in most cases is full price but the turnaround is one week or less. Can't beat that. 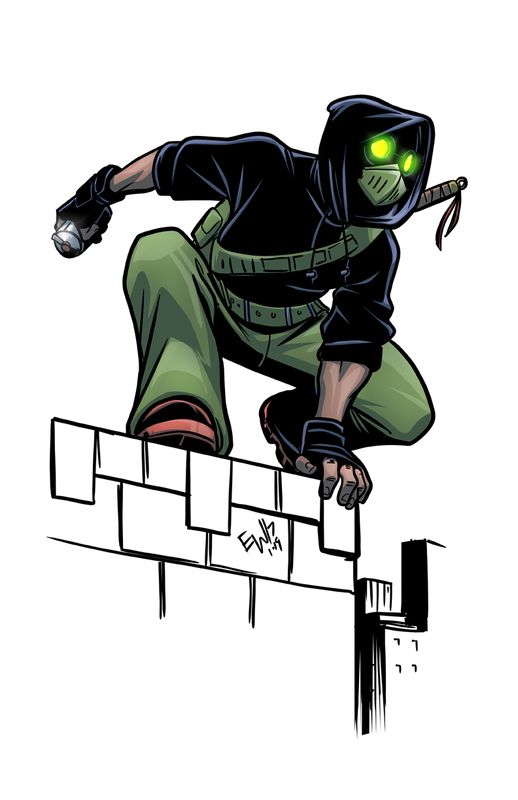 Penciled/ Inked in Inkscape, Colored in photoshop! Check out http://eryckwebbgraphics.deviantart.com for future slot openings. Good chance of a couple opening over this weekend, stay tuned! A 20 minute warmup this morning, of the first of a series of Gummi Bears themed warmups this morning! Drew the youngest, aspiring knight, Cubbi Gummi! I approached it as a chibi and sort of melded my chibi style with the disney character design and this came out! It actualy was a good tricky exercise even though it seems like it might be simple. Stretched out the brain and drawin muscle good! More to come over the course of the week. Inkscape about 20minutes, while listening to Sepultura's new album Machine Messiah. Its like my 5th listen through- its just a real treat for the ears all the way through. Something for everyone, lots of energy and artistry in the instrumentation and such. Good lyrics too. Anywho! Not most peoples first choice for listening to while drawing Gummi Bears but... hey... why not? LoL. 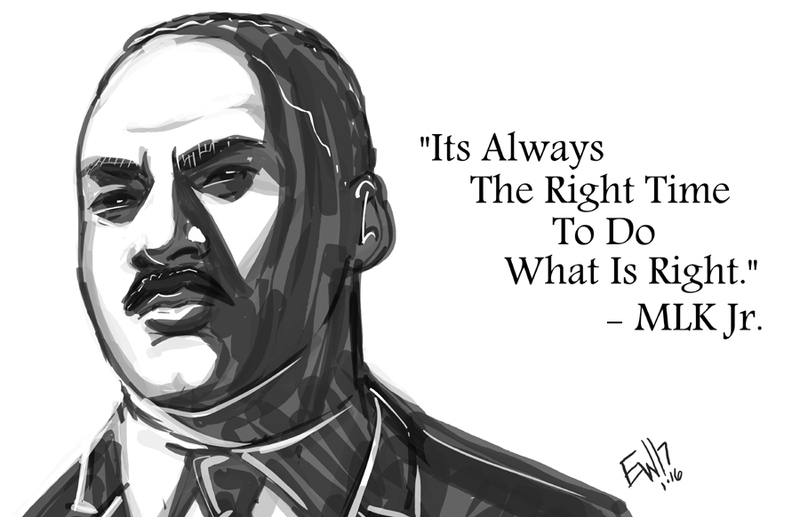 Todays daily discipline/ morning warmup drawing is in honor of the renegade of civil rights and racial equality Dr Martin Luther King Jr! A man who did what needed to be done even if it ruffled a whole lot of feathers. And those feathers needed ruffled. Even if it risked is own life. Paving the way for many changes and possibilities to come. Theres a lot of quotes to choose from, but I always like this one simple at to the point. The title of this drawing comes from the fact I was listening to Rage Against The Machine playlist while drawing this. And the one that fit the best was 'Renegades of Funk' which talked about MLK, MalcomX and other renegades of their times and places when they rebelled against the norm somebody brought the hammer down. They knew it would inevitably happen but stood up against injustice anyway. And so the official last in this week's 'Transformers G1' series of daily practice drawings/ warmup drawings is PowerGlide! Other ones i did not get to but may do in the future at some point unknown is gears, seaspray, cliffjumper, reflector, wheelie, sharkticon, hound, omega supreme - just to name a few. Stay tuned for a new theme starting tomorrow. Leaning towards another popular cartoon franchies or another. Well this is today's Daily Discipline as i like to refer to it. An attempt to practice drawing once a day to keep my skills sharp and at the current level (or better). I originaly said Friday was last day of this weeks transformers g1 theme, but I guess I forgot about Saturday and Sunday :) So heres a bonus! I really couldnt think of a lot of decepticon little guys except for reflector and what soundwave has. All the decepticons were fairly big guys. But on the autobot roster you had huffer, gears, brawn, bumblebee, cliffjumper, seaspray, beachcomber, powerglide and more. Also those are the guys I tend to enjoyed the most when they were featured on the show. This BeachComber comes from the episode I remember him most from which was the one where he finds this slice of paradise and is enjoying time with the birds and animals of the forest and then the decepticons and autobots end up fighting over this natural spring of gold chemical that gave them all energy and durability and all that. And beachcomber had struggled with all the destruction to the beautiful forest and havok it was playing on all the peaceful creatures inhabiting it. It was one of the more significant episodes that hit you right in the feels and beachcomber was in the middle of it all. Anywho, thats where the bird came from :) Fun stuff - enjoy! Inkscape about 45-50 minutes start to finish ( am a bit tired so it took a bit longer ). A little birdy told me I'll do one more tomorrow and probably do an impromptu stream of it over at twitch.tv/eryckwebb like i did this one. Well I wanted to cap off the week by doing a Decepticon this round. 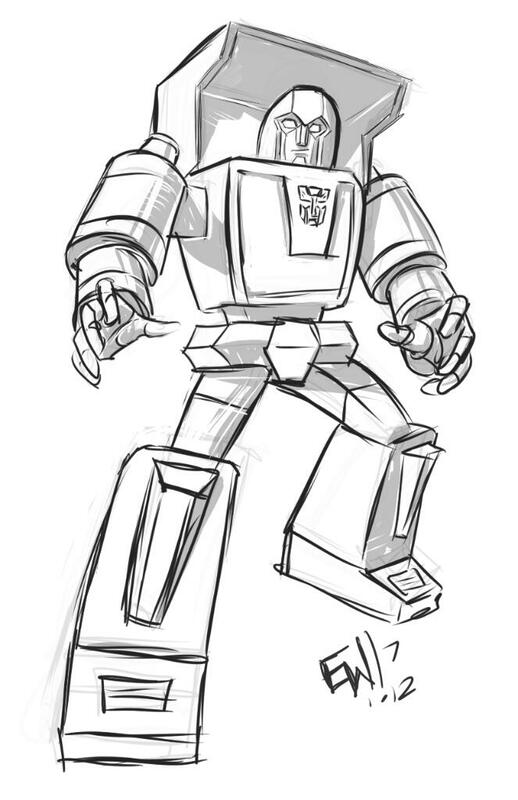 I thought for Friday the 13th, the only F named Decepticon I could come up with and was interested in drawing was Frenzy! The lesser known of the cassettes that is a twin to Rumble. 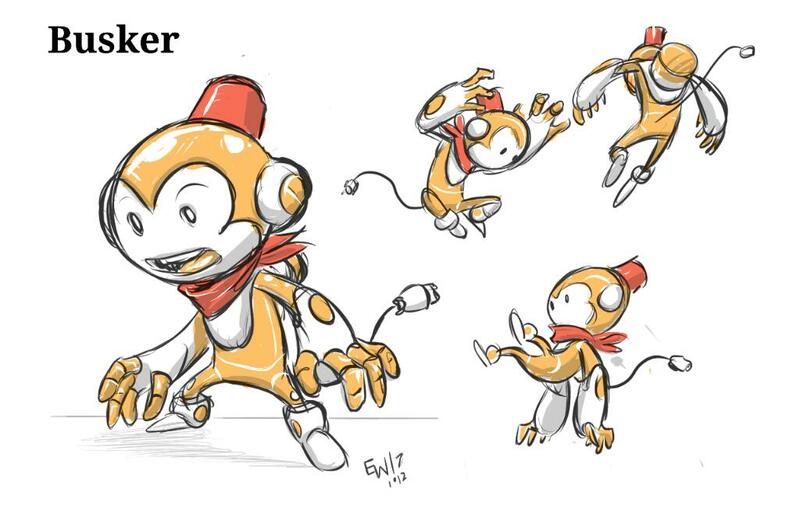 I actualy like Frenzys personality/ color scheme a bit better. So concludes my Daily Practice session this week, in the theme of Transformers G1 characters! Will pick another theme next week and keep the daily discipline going! Have a great weekend everybody and see you on the flip side! And finaly my last personal drawing session from yesterday evening while watching TV with the better half. This is a character I dreamed up when I was a kid. 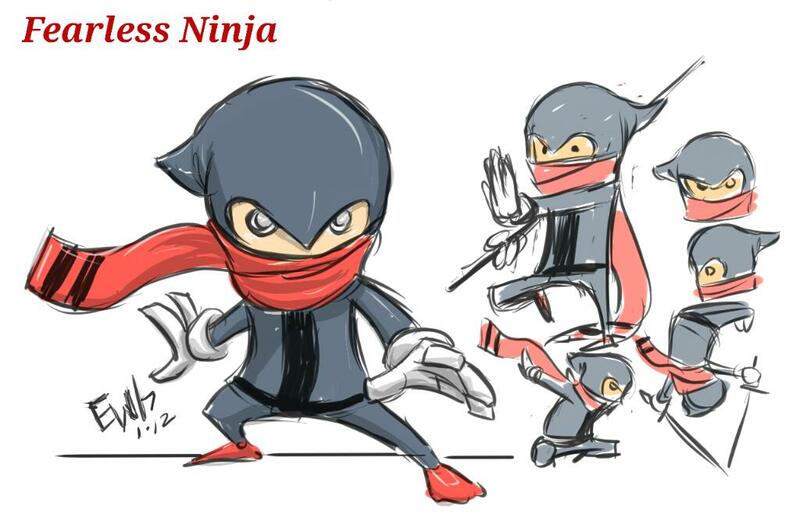 'The Fearless Ninja' ... a sort of slapstick strip-to-strip series where each episode he was trying to defeat a foe, or save the day or compete with a rival and he always fell short. But he is always fearless in his endeavors and never gives up! Anyway thats the idea for now haha. Fun little guy to toy with for now. Didnt get a chance to post this daily practice drawing from yesterday. Its Huffer from Transformers G1 - always liked the little guy although he was a whiny thing. A stand out moment was when Optimus was injured and he towed his trailer back to base for him. He was so much smaller haha. I thought his design was a bit odd with his rotating arms as one big solid column, i thought it'd be better if the smaller part actualy moved like a fore arm. other than that, heres huffer in G1 80s cartoon form! Autodesk Sketchbook Mobile app on Samsung Galaxy 10.1 2014 about 30 minutes. 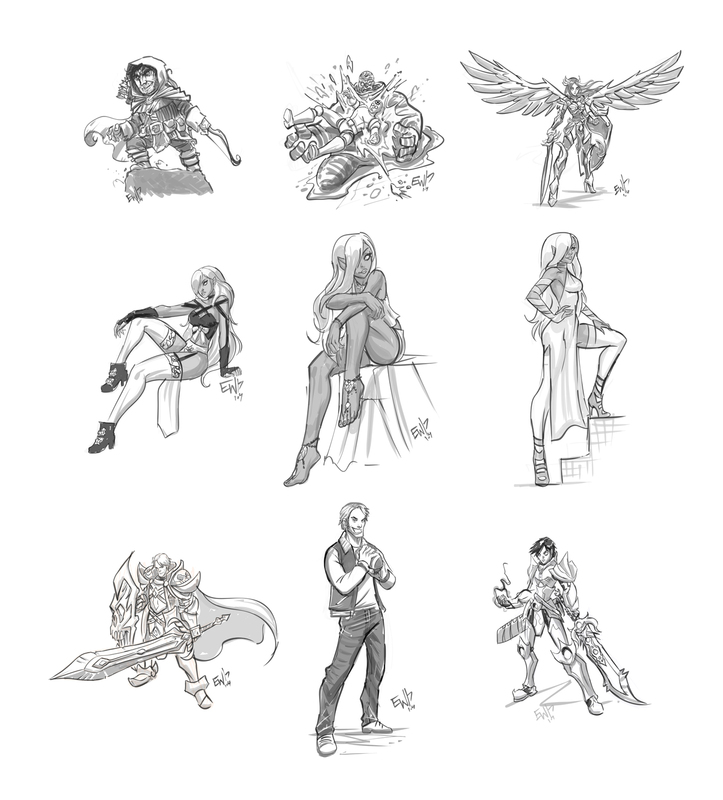 Drew all these during todays stream totaling about 4 hours start to finish. Had some goals hit, bonus giveaway action, some fun gratitude spins and a lot of fun drawings. This marks a first attempt since I can remember at least this year of reincorporating inks and colors back into the stream. That way, theres no 'bah no time in the evening' or 'bah no time in the morning' - when an item comes up on the list in the stream, its just done. And i will work on them five days a week 3-4 hours a day one request at a time. So far I like it. I do find the INSTA ability is hindering some progress on the main list. well, no thats not accurate. Cause those who win it are usualy giveaway winners or picking items randomly from the list. But more so, I'd like to tweak some things as it goes. Good first run though. Drawn/ Inked in Inkscape colors in photoshop. As of this post, all art sent via drop box links to email. if its not in your email check your twitch whisper. thanks guys! do it one more time tomorrow before ending for the week! then we'll continue next week. dats right. Hope to see you at the next stream! Follow eryck webb's twitch channel at http://www.twitch.tv/eryckwebb and see you M-F at 2pmEt for the next stream! Didnt get to post this earlier, but heres todays practice drawing/ morning warmup in the theme this week 'G1 Transformers' - guess i prefer the autobots, they ARE the heros after all. But I seem to prefer the little guys too for some reason. No idea. Maybe the underappreciated ones but I always loved when they were in the show. About 15 minutes. Enjoy! Trying to get back in the daily warmup drawing habit to start my days. This week the theme will be different G1 transformers! Heres one of my favs, BumbleBee! Never reall drawn him before was fun! Inkscape start to finish about 45 minutes. On to paid work! Have a great Monday! As of this post, all art sent! 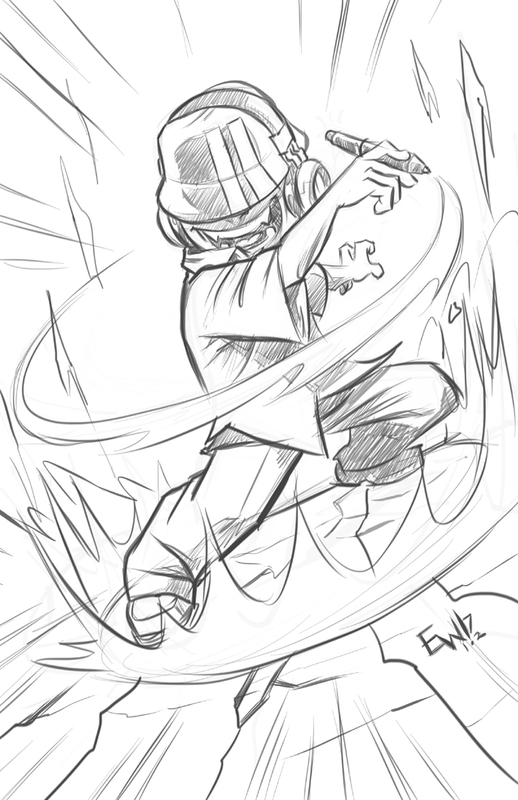 Had a blast getting over the hump today on the EWG twitch stream, 'Drawing Request Show'. Episode 137 had a slew of lucky winners and a great variety of requests. Look forward to doing it again tomorrow. Hope to see you at the next live stream at http://www.twitch.tv/eryckwebb , every Monday-Friday 2pmET! Be there or be square. As of this post, todays stream art is sent! Drawings from todays DRS episode 136 - there was a lot of hijinx and prize winning so only 6 got drawn today but I enjoyed every minute of it. Have a great night and see folks back 2pmET on Wednesday for another twitch.tv/eryckwebb stream! Hump dayeeee. Also going to attempt to come back and stream Drawing Request Show upgrades tonight 9pmEST get a whole sheet of upgrades inked for the patient boys and girls! Excited for a new year and a new chance at creative growth and exploration! This was an art I was drawing for use as website/ facebook banners but it didnt look great when cropped for banners and such but I love it as the whole 11x17 piece. Sketched / layed out in Inkscape then finished penciled in Autodesk Sketchbook Pro. Every year seems to yield something new and unexpected in my business and I am sure 2017 will be no different. Heres to new, wonderful and unexpected surprises in the new year! Its going to be great, and blow 2016 out of the water, I can feel it! As of this post, all art sent! Happy New Year! 2017 is off to a rockin start. Great to be back doing Drawing Request Show again! Feeling refreshed and re focused after a long holiday! 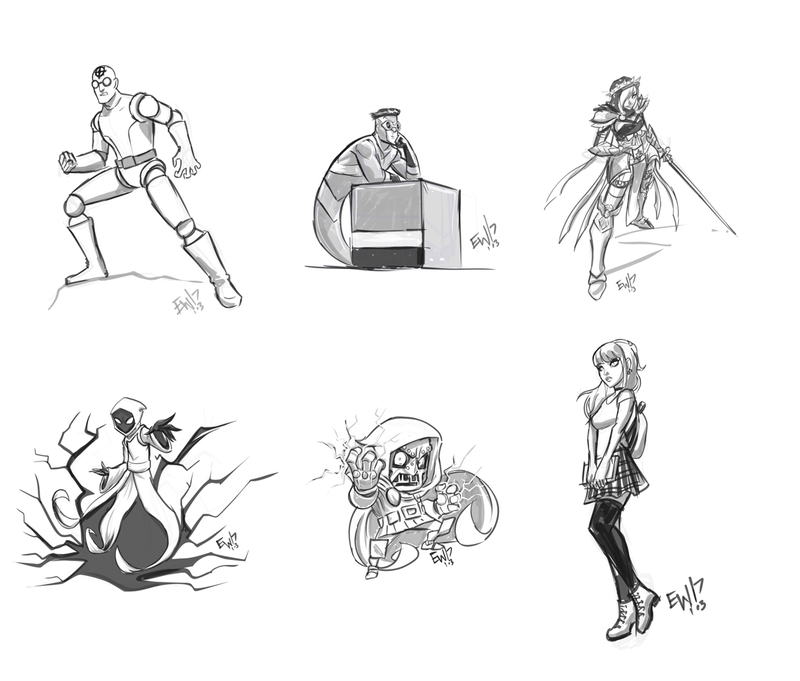 5 of these were drawn as EWG commissions this morning, the rest were done during todays Drawing Request Show! 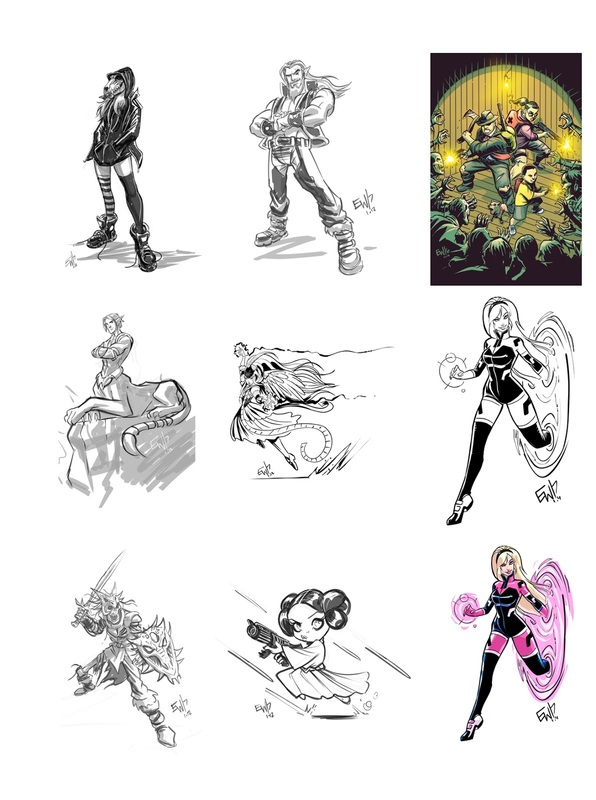 There was a time when I first endeavored i this business I struggled to draw 5 finished pencil drawings a day, whether my own original art or commissioned art. Now I am drawing upwards of 10-15 a day equivalent. I'd say I've gotten faster/ better. Look for the next Drawing Request Show stream Tuesday 2pmET and Tuesday night at 8pmET will be doing DRS Upgrade stream - this week I am slapping upgrade requests on a canvas and inking them all up and sending them out for coloring. Next week I[ll get the flats back and shade/ highlight them. That queue is going byebye! And for now, Im going nite nite! See you at the next stream!